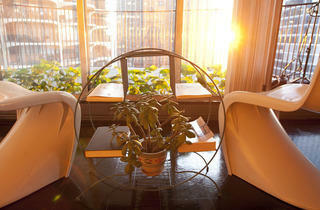 An architect has outfitted his 500-square-foot apartment with modular furniture. 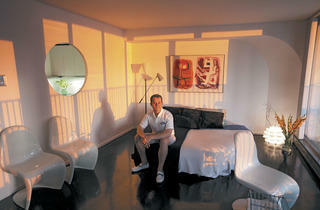 Photograph: Jeremy BolenMost studio-apartment dwellers don't dream of entertaining on a grand scale. Dinner parties can get awkward when people find themselves lounging, cocktail in hand, on the only place in the room to sit: the bed. 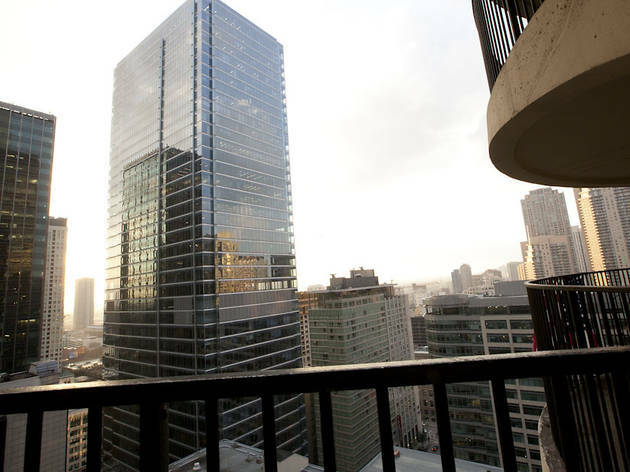 But James Pike, who's lived in his 500-square-foot Marina City studio for four years, doesn't have that problem. 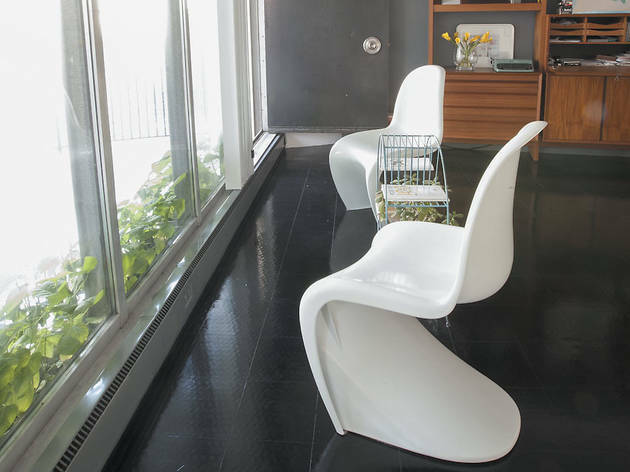 With its reflective black tile floor and sparse furnishings, Pike's space feels a touch austere, but his deliberate design choices have turned this small space in an iconic Chicago building into the perfect place for living and entertaining. A designer at West Town architecture firm Scrafano Architects and program assistant at the Graham Foundation, Pike recently celebrated his 33rd birthday at home. 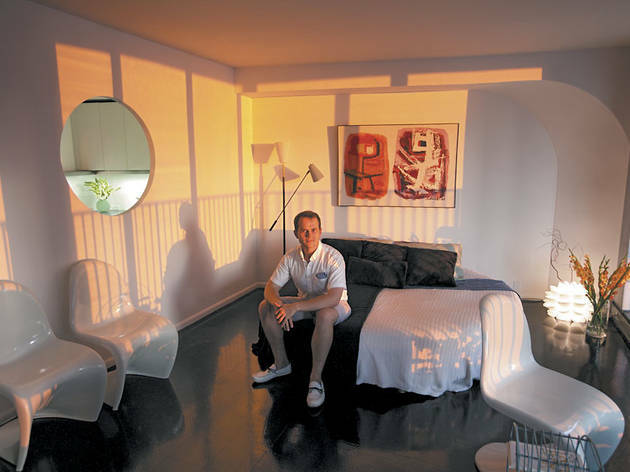 "I had 47 guests in this apartment," he says. "Comfortably." Pike sleeps on IKEA's flexible Sultan Sandane, a round bed with a thin, removable mattress that reveals a modular unit that breaks into four ottoman-like parts, which can be configured into several seating arrangements. 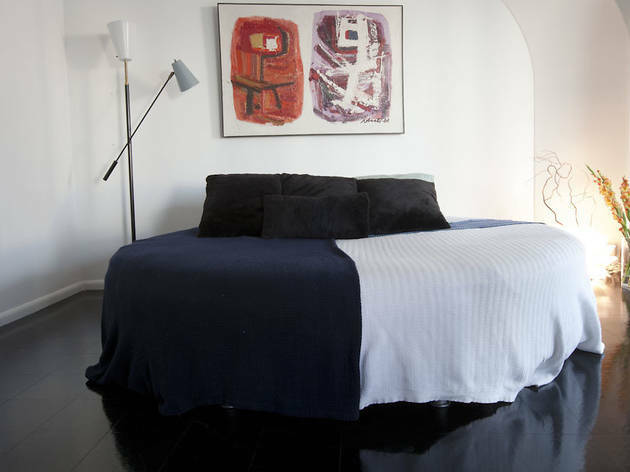 "It's too much like a studio apartment when you walk in and there's someone's bed in the middle of the room," Pike says, adding that even when he doesn't break up the piece, the round shape doesn't make guests feel as if they're sitting on his bed. "It's a sculptural thing," he says. Originally Pike's unit was carpeted. "It looked like someone had smoked in here for a living," he says. "It had seen better days." 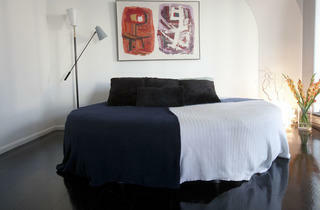 He made a weekend project of removing the carpet to reveal the unit's original black vinyl-tile subfloor. The reflective surface makes the space feel bigger. And the hard floors make it easier to clean and rearrange furniture at a moment's notice. 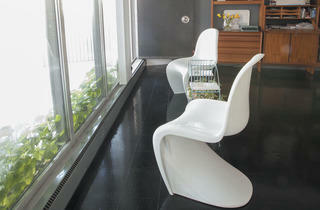 Photograph: Jeremy BolenPike's four Panton-esque "S" chairs serve many functions. 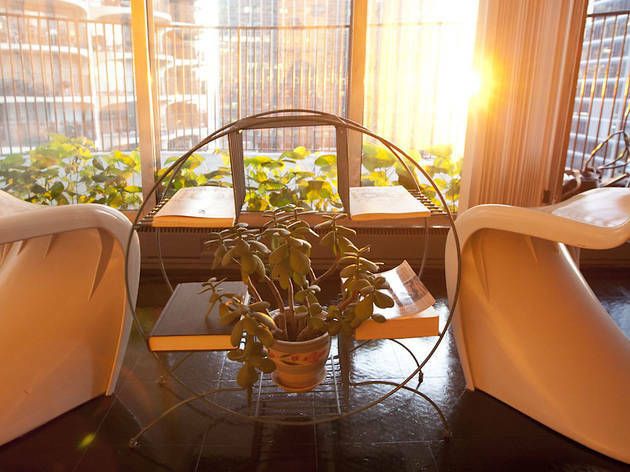 The lightweight acrylic's all-weather durability makes for perfect patio furniture, but the chairs also work lined up against a wall when not needed, and at the foldout desk for working. The Scandinavian teak shelving unit fits perfectly within the arc-shaped sculptural structure of the unit's north wall. Coherent, classic and functional, the piece houses Pike's design books, office supplies and desk accessories. A foldout desktop serves as a modular office when Pike needs it, and gets hidden when he doesn't. 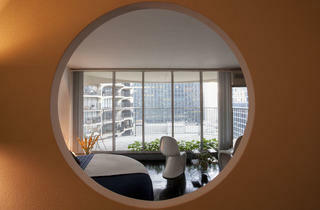 Photograph: Jeremy BolenArchitect Bertrand Goldberg's original design for the Marina City studios didn't include a pass-through in the wall between the kitchen and living area, but residents have modified the units with varying degrees of success. "Sometimes the aperture is huge and it kills both spaces by making it too connected," Pike says. 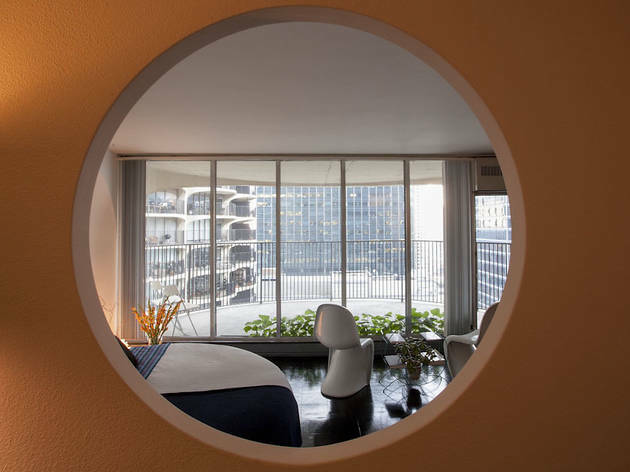 His contractor modified the rectangular bar window his unit came with to a circular shape big enough to facilitate conversation between rooms, but not so big that the kitchen invades the living space. 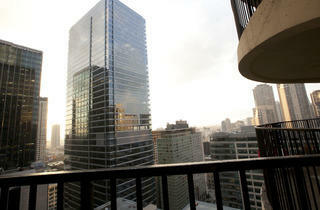 Photograph: Jeremy BolenSunlight streaming into Pike's apartment makes the space feel bigger.